Oncology Biomarkers: Schematic workflow of lung cancer biomarker discovery. Schematic workflow of lung cancer biomarker discovery. Biomaterials from three for protein biomarker discovery,lung tissues, sputum, and body fluids, are usually used. In sputum, cancer cells apart from cancer sites are supposed to be detected. In biopsied lung tissues, not only cancer cells but also other molecules involved in self-defense mechanism of human body such as, immune cells, cytokines and derivatives from immune or inflammation responses can be found. In body fluids, although pleural fluids, ascite, urine etc can be used, blood is most commonly used in biomarker studies for its advantages of easy access and routine blood chemistry measurements in the patients. In blood, however, more potential biomarkers exist and this includes many biomarkers found in biopsied cancer tissues and many circulating protein fragments generated in the diseased tissue microenvironment or by circulating proteins derived from the diseased tissues. After proper preparation each protein can be analyzed by similar procedures of the identification, verification, and validation. For protein identification, prepared samples are analyzed by mass spectrometry. LC-ESI-MS/MS and MALDI-TOF/MS are most commonly used platforms. Potential biomarkers, elevated or decreased in their expression levels, are confirmed by Western blot, ELISA or by recent development of multiple reaction monitoring. BMB Rep. 2008 Sep 30;41(9):615-25. 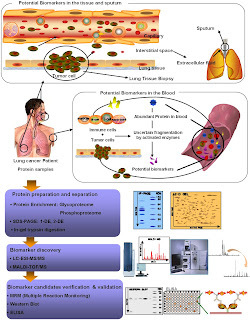 Biomarkers for the lung cancer diagnosis and their advances in proteomics.